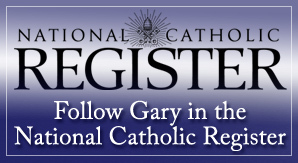 Confused About Eucharistic Adoration? 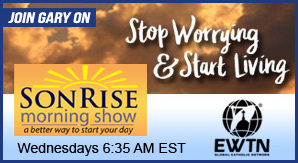 Vinny Flynn Can Help! It’s no secret that I’m a big fan of Eucharistic Adoration. 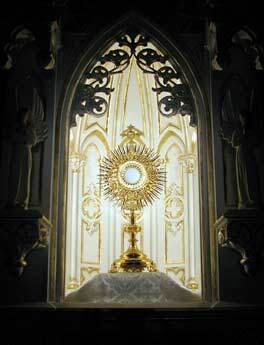 I greatly look forward to the time that I spend before Jesus in the Blessed Sacrament. When I’m with Him, I feel at peace and the time seems to fly. That wasn’t always the case with me, however. 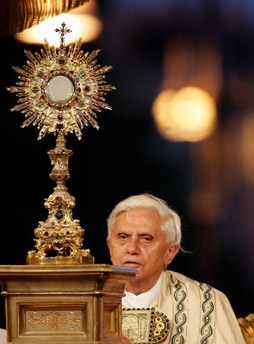 I used to be very confused about the idea of praying before the Blessed Sacrament. I had trouble understanding the point. Isn’t Jesus everywhere? 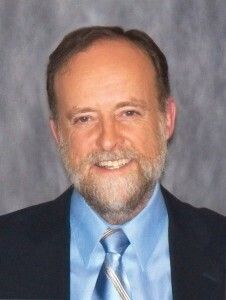 Why do I need to go to the adoration chapel to speak with Him? Fortunately for me, I was influenced by some very holy people, including my late Mother-In-Law, Betty. She would faithfully pay visits to the chapel to spend time with Jesus. After listening to her speak about the experience, I decided that I needed to give it a try. 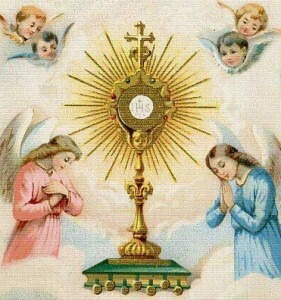 Although I’d been to adoration in the past and found it to be rather dry , I thought that things would now be different. I heard Betty speak about how great it is to spend time with Jesus, so I was all ready to experience the same thing. I signed up for a regular holy hour and when I got to the chapel, I sat down and thought to myself, “Now what”? I’ve got an hour…do I pray? Do I talk? Do I listen? Do I just sit here? I was completely frozen! It took me a long time and a lot of research to answer those questions and, to be honest, I still wonder about these things sometimes. 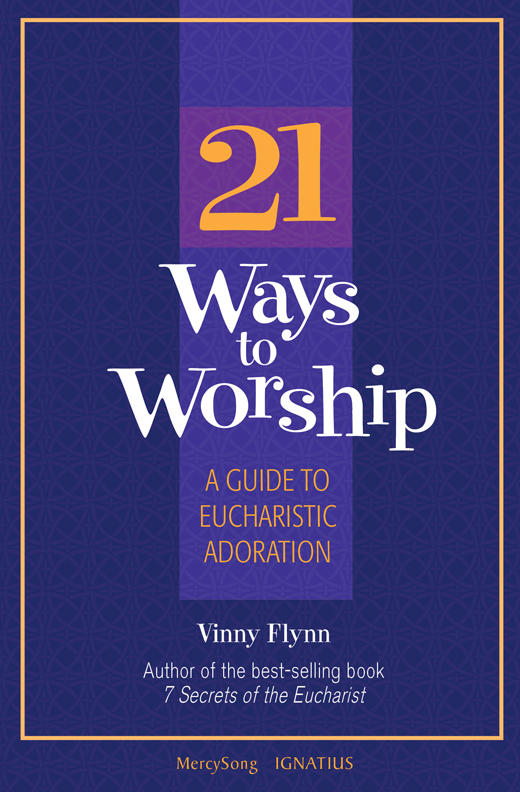 That’s why I was so pleased when I was asked to host the initial stop on Vinny Flynn’s blog tour for his new book, 21 Ways To Worship (A Guide To Eucharistic Adoration). I was even more pleased as I read the book and discovered that he answered ALL of my questions – past and present! In an easy to read and entertaining way, Vinny Flynn gives us 21 different suggestions for what to do while we’re adoring Jesus in the Blessed Sacrament. More importantly, he makes a strong case for WHY we should adore Our Lord in this manner. I know it’s a well used cliche, but this is one book “you won’t be able to put down”! Once I started reading, I kept saying, “I’ll read one more chapter” and, before you know it, I was finished the book. I’m also looking forward to my next visit with Jesus so I can put some of these suggestions into practice. Whether you’re struggling to understand why to visit Jesus in the Blessed Sacrament or simply looking for suggestions on how to worship Him once you’re there, this book will satisfy your needs in a BIG way. I highly recommend it and urge you to not only buy a copy, but to move it to the top of your “reading stack” as soon as you do! 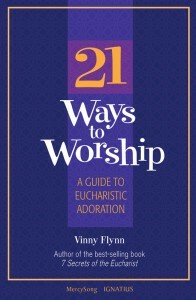 Want to win a free copy of 21 Ways To Worship? Just comment on this post and I’ll randomly select one winner, who will receive a copy. The contest closes at 12 Midnight (Eastern Time) on Saturday, May 25, 2013. At the center of our Catholic Faith is the belief in the Real Presence of Jesus in the Eucharist. Unfortunately, we often lose sight of or don’t appreciate the profound blessing that we have been granted. If we desire to become better Catholics and improve our relationship with the Lord, we must deepen our love for the Eucharist. How can we do so? One of the best and most underutilized ways is to turn to the Mother of Jesus, Mary. By getting to know her and studying her life, we can grow closer to Our Lord who is fully present in the Eucharist. In his encyclical, Ecclesia de Eucharistia, Blessed Pope John Paul II devotes an entire chapter to Mary, “Woman of the Eucharist”. Let’s examine some of his thoughts on how Our Lady can help us better understand the Real Presence of Jesus in the Eucharist. Sometimes referred to as Our Lady of the Most Blessed Sacrament, Mary can take us by the hand and lead us to a closer relationship with the Eucharistic Christ. While observing that “at first glance”, the Gospel is silent on the subject of Mary and the Eucharist, the late Holy Father makes an interesting observation. We know that Mary was present with the apostles who prayed “with one accord” (Acts 1:14) for the coming of the Holy Spirit. Therefore, it follows that Mary was most certainly present at the Eucharistic celebrations of the early Christians who were devoted to “the breaking of bread” (Acts 2:42). Blessed John Paul II then points to Mary’s interior disposition and observes that Mary is a “woman of the Eucharist” in her whole life. Scripture tells us that faith is “the assurance of things hoped for, the conviction of things not seen” (Hebrews 11:1). The Eucharist is certainly a mystery of faith and cannot be grasped by our limited human understanding. Accepting Jesus’ command to “Do this in memory of me”, requires us to deny our senses and humbly submit to His instruction. What better advice can we be given than the words of Mary at the wedding feast of Cana when she stated, “Do whatever He tells you” (John 2:5)? Just as He changed water into wine, He can turn ordinary bread and wine into His Body and Blood. By listening to Mary’s advice, we can accept (without fully understanding) the miracle that occurs on the altar and embrace Our Lord’s words, “He who eats my flesh and drinks my blood has eternal life” (John 6:54). By offering her womb for the Incarnation of God’s Word, Mary lived her Eucharistic faith even before the institution of the Eucharist. At the Annunciation, when Mary conceived the Son of God, she foreshadowed what happens to us when we receive Holy Communion. As a result, according to Blessed John Paul II, “there is a profound analogy between the Fiat which Mary said in reply to the angel, and the Amen which every believer says when receiving the Body of the Lord”. Although we sometimes forget the significance of our response to the words “The Body of Christ”, by replying “Amen” we are expressing our belief that Jesus is truly present in the Eucharist. Mary’s belief in the mystery of the Annunciation (“Blessed is she who believed”) anticipates the Church’s belief in the Eucharist. 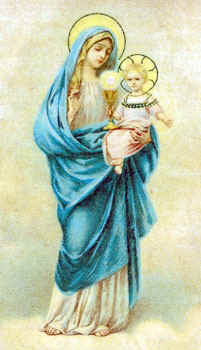 In her daily preparation for Calvary, Mary experienced a kind of “anticipated Eucharist” – one might say a “spiritual communion” – of desire and of oblation, which would culminate in her union with her Son in his passion, and then find expression after Easter by her partaking in the Eucharist which the Apostles celebrated as the memorial of that passion. According to Blessed Pope John Paul II, “in the Eucharist the Church is completely united to Christ and His sacrifice and makes her own the spirit of Mary. This truth can be understood more deeply by re-reading the Magnificat in a Eucharistic key”. He points out that when Mary proclaims “My soul magnifies the Lord and my spirit rejoices in God my Savior”, she is praising God “through” Jesus (who is in her womb), “in” Jesus and “with” Jesus. This, he observes, is the true “Eucharistic attitude” and that “the Eucharist has been given to us so that our life, like that of Mary, may become completely a Magnificat”. Saint Louis de Montfort, who greatly inspired John Paul II, recommended that the Magnificat be recited after the reception of Holy Communion. In doing so, we unite our voice with that of Mary and allow our often weak faith to be infused by her perfect and unfailing faith! During this month devoted to Mary, why not take some time and meditate on her role as Our Lady of the Most Blessed Sacrament? There is no better person to help us increase our appreciation for the Eucharist than the Mother of Our Lord. She knows Him better than any other human. Ask her to help you believe the “unbelievable”! 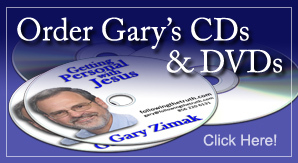 So, You Just Received Jesus…Now What? I’m sad to admit that, over the course of my life as a cradle Catholic, I have received Our Lord in Holy Communion many times and didn’t have too much to say to Him. It’s understandable, isn’t it? There are lots of important things to do after receiving Communion: we have to look around the church and see how many people we know, we have to plan what we’re going to do after Mass and let’s not forget that we have to read the parish bulletin to see if we’re having coffee and donuts after Mass. With all of these distractions, it’s easy to forget that we received the Lord and Savior of the Universe into our very bodies in a foretaste of the Heavenly banquet! While I’m obviously using sarcasm to make a point, it really can be difficult to keep our focus after receiving Holy Communion. Since the Church teaches that there are infinite graces available after we receive Jesus, however, this isn’t the best time to become distracted. But what can we do? In reality, there is a simple acronym that help you to better focus on speaking to Our Lord after receiving Him in Holy Communion. The acronym? Adoration – Lord Jesus, I bow down before You and give you glory. I adore and love You and acknowledge Your power over all areas of my life. I ask my Blessed Mother, Mary, to supplement my feeble prayers and give You the proper adoration and praise of which You are so deserving. 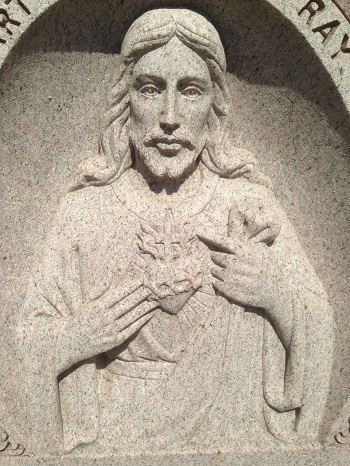 Contrition – I am sorry that MY sins caused You to die a painful death on the cross. Please forgive me, Jesus, for the times that I’ve failed to “do the right thing”. Have mercy on me, a poor sinner. Thanksgiving – Lord, I give You thanks for the many blessings in my life: my family, my job, my house, my friends. I thank You for the gift of the Catholic Church and her clear and infallible teachings. I thank You for the Sacraments which give me the grace that I need to lead a good and holy life, especially for the gift of Your Body, Blood, Soul and Divinity in the Holy Eucharist. Supplication– Please help me, Lord. I am a sinner who is struggling to be good. I know that I can’t do it alone and I ask for your help. Allow me to receive all of the graces possible from this reception of the Eucharist. Help me to love You more and grant me an increase in faith, hope and charity. I ask You to pour out Your blessing on my family and friends and those who have asked for my prayers. Why not try it for yourself and see what happens? The next time you receive Jesus in Holy Communion, close your eyes (the first step in avoiding distractions) and think of “A.C.T.S”. Go through the letters, one by one, and speak from your heart. I predict that you’ll find yourself getting closer to Jesus than you ever thought possible!